One in three UK workers don’t have any form of breakout space to get away from their desk and over half (56 percent) of them don’t even have anywhere to eat lunch in their office, new research claims. 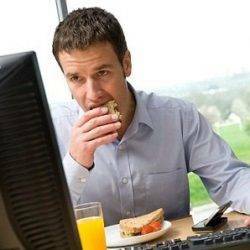 The survey of UK office workers carried out by Furniture123.co.uk suggests that as a result of this 34 percent of employees say they resort to eating lunch at their desk, which they feel is having a detrimental effect on morale and productivity. Nearly three quarters (69 percent) of those surveyed felt they worked less productively as a result of not taking a break away from their desk over lunch, and almost half (47 percent) believe they would work more efficiently in the afternoons if they took a full hour for lunch. The research also revealed that 46 percent said they would like to get out of the office for a walk during their lunch break, but almost half of these (47 percent) felt they had nowhere to go or didn’t like the local area. The research revealed that 35 percent of UK workers take their lunch outside to eat when the weather is nice and a fifth (21 percent) even confess to running over their allocated lunch break. When asked what breakout features they would like to see in the office, a designated lunch area topped the list (76 percent), followed by sofas (70 percent) and bean bags (62 percent). Completing the top 5 were a garden or terrace (59 percent) and a ping pong table (52 percent).